Contemplating my white and blue outfit and shoes today (the cutest shoes ever! <3), I wore Majolica Majorca's white eyeshadow and blue liner (which, by the way, stayed in place really well and didn't give me the panda eyes I got from the black liner I wore yesterday - thank Goodness, blue panda eyes would look like I got into a fight! 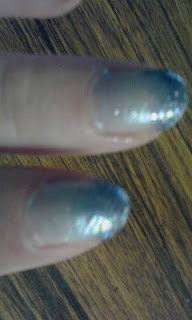 ^^;) and also a blue nail design. 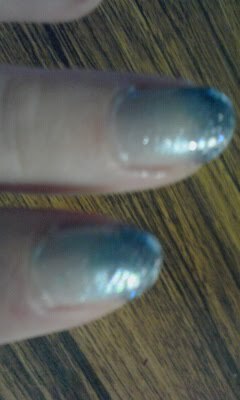 I used a light blue polish by sweets and a dark blue polish from Maquillage, both with glitter. The Maquillage polish is a bit disappointing because despite looking dark in the bottle, I had to layer and layer before I got something more than glitter. Do you like to paint your nails? In more colours than one, and also "unusual" colours like blue?